We chose Tobii Glasses 1 for field studies in control rooms because of its portability, ease of wear, and ease of use. The results suggest that accommodation of different workflows, respectively multiple visual sampling strategies, may be beneficial in control room design. 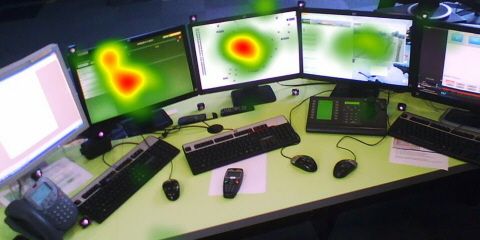 The eye tracking revealed that there is no single workflow in completing the required tasks, rather each individual views and processes the information differently. Thus, it is important that the control room environment and procedures support multiple visual strategies. The researchers found that each operator favored different information sources to complete the same task. 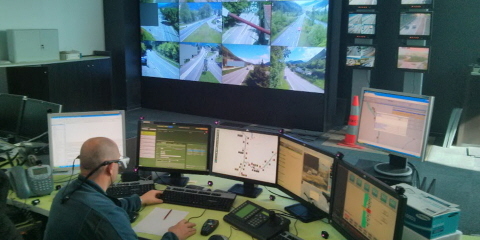 There are differences in CCTV monitoring between the operators, resulting in viewing modality preferences. Operators aligned head and eye direction with respect to the areas of interest for most of the time and the contribution of head movements to gaze shifts is highly subject specific. Using a graph-theoretic analysis from the emerging field of social network analysis, researchers proposed new metrics for visualizing and measuring attention behavior in environments containing information flows. By analyzing these patterns of attention, they gained insight into the relative importance of the different information sources and the ways operators deal with them.